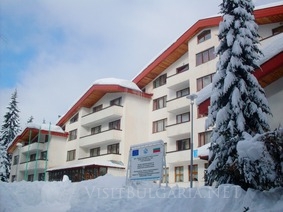 Location: The hotel is situated about 300 m away from the bus station in Pamporovo and provides easy access to nature attractions, tourist routes and ski runs. It is situated in a thick pine forest and provides tranquility for a good rest. Accommodation: "Elina" hotel offers standard, simply furnished rooms and luxury apartments. There are 75 regular and 11 additional beds in 22 double, 5 triple rooms, 4 standard and 4 deluxe suits. All rooms and suits are equipped with WC, shower bath, cable television, telephone, mini bar. There is also a fireplace in every deluxe suit. A cosy restaurant with 100 seats and a big choice of exotic and national dishes, as well as selected wines. Lobby bar in alpine style with 47 seats, comfortable and modern design, with a rich menu of high quality alcoholic, soft and hot drinks. Fireplace. The Nightclub has 50 seats and offers hot dancing nights in the rhythm of the newest discotheque hits. Sports Facilities: Hotel "Elina" offers at guests disposal a modern well equipped sports center, where you can enjoy sauna, jacuzzi, fitness, massage, herbal bathtub, vertical hydro-massage wall. Billiard room, table tennis, computer and electronic games. For its guests "Elina" hotel organizes trips to nearby attractions with hotel's own transport.